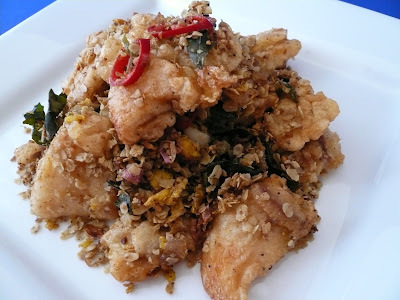 I was at Sue's blog and saw her Cereal Crispy Fish and it look so good. So I finally get to cooked this dish for dinner. Mixed all the above and fry it in hot oil until golden brown. Remove and drain the oil on paper towel and set aside. Remove all the oil from wok. Heat up the butter in the wok and stir fry the shallots and garlic until lightly brown. Add in curry leaves, chilies and stir fry for a few second and add in the beaten egg yolk. Continue to stir fry for 10 second and add in the oats. 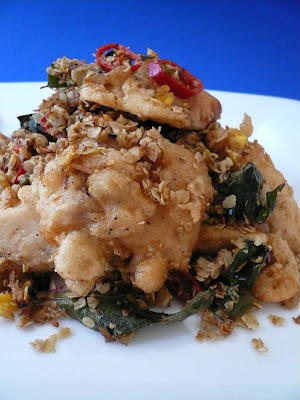 Stir fry until the oats turn golden brown then add sugar, salt and pepper to taste and then add in the fried fish fillets. Mix well and served. When I cook rice I always cook a bit more because I can always make fried rice the second day with all my leftover meat, vegetables or anything I can find in the fridge. What I like most about fried rice is because it is a complete meal by itself with meat and vegetables in it. 2) Heat 1 tbsp of oil and pour in the beaten eggs. Scramble the eggs and dish out. 3) Add about 2 tbsp of oil in the wok and saute the garlic and shallots until lightly brown. Add in the carrots and stir fry for 1 min. Then add in the char siew and snap peas and stir fry for 30 second. 4) Add in rice, scramble eggs, soy sauce, salt and pepper to taste and continue to stir fry until everything mix well. 5) Dish out and garnish with red chili or green onions. Serve warm. 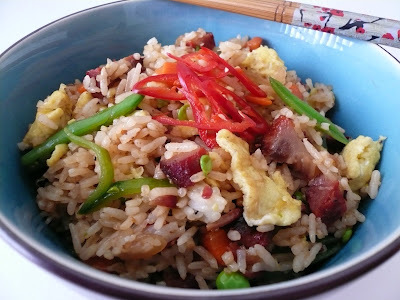 Note : You can used any leftover meat like roast chicken or fresh meat and frozen mix vegetables for this fried rice. 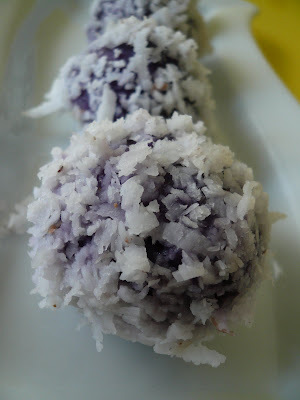 This simple recipe is specially for my niece Amelia in Australia :) She is learning to cook. 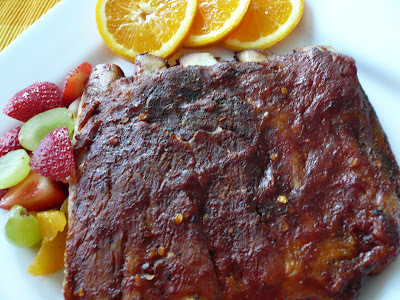 I went to Wegman's this afternoon and saw some beautiful ribs and that reminds me of Beachlover ribs. So I called hubby up to see if he wants to eat some ribs for dinner tonight and he said he don't mind at all. I didn't grill the ribs but cooked them in the oven for two hours. I season the ribs with salt, pepper, garlic powder, paprika, chili flakes, lemon salt and a little bit of sugar. Marinate for at least 2 hours. Then wrap the ribs tightly in two layers of aluminium foil and slow bake in 300 degree F over for 1.5 hours. 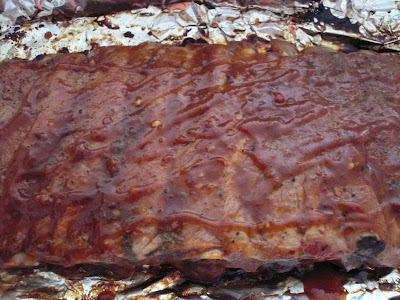 Open the foil and base the ribs with some store bought BBQ sauce and increase the oven temperature to 375 degree and continue to bake without the foil until it tender and brown. It will take another 1/2 an hour. I served the ribs with some salad. Made this very simple dish today. Cut the long beans to about 1 1/2" long. Put some oil in the wok and stir fry the garlic and onions until lightly brown. 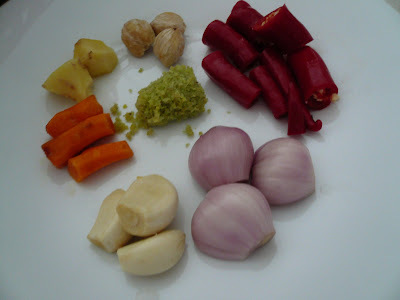 Add in the sambal and stir fry of 1 min. 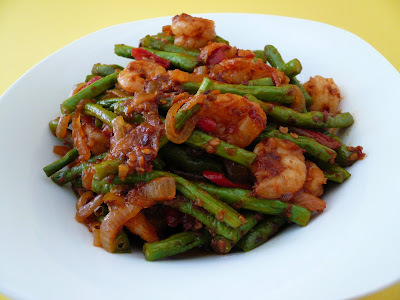 Add in shrimp and cook for 1 min and then the long beans and cut chili. Stir-fry for about 3 min or until the beans is cooked. 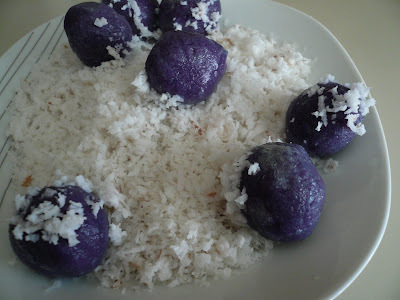 Serve with warm rice. 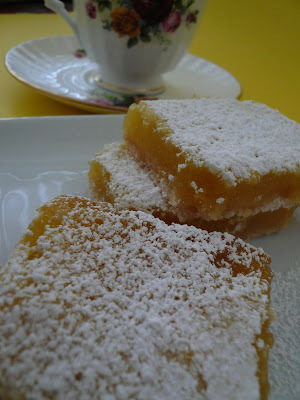 I remember the very first fancy cake I bake in school was pineapple upside down cake. That was so many years ago. 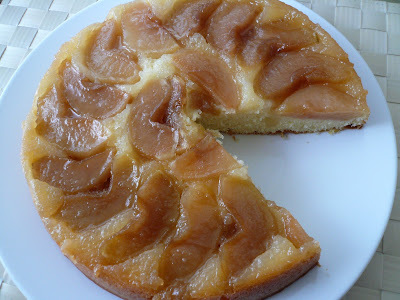 Nowadays you can make so many kind of upside down cake with apples, apricots, pears, peaches, cherries and etc. 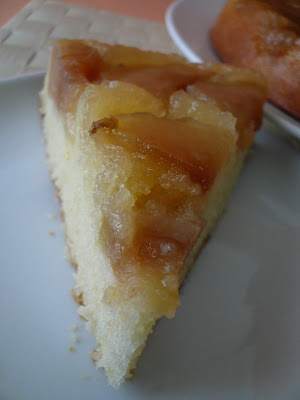 This cake is really moist and tender and still taste good after a few days. With a few simple ingredients you are able make a beautiful and delicious cake for your family. 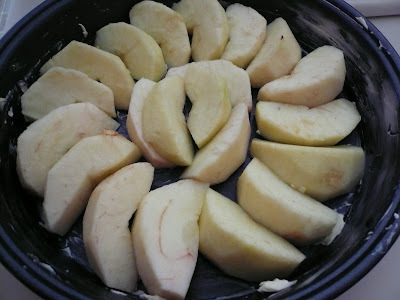 1) Butter a 9" baking pan and arrange the cut apples on the pan. 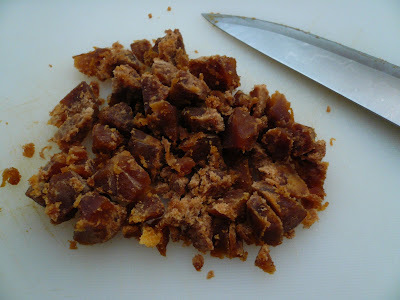 2) Cook the sugar and water on high heat until it became light brown caramel. 3) Pour evenly over the apple slices and set aside. 1) Cream butter and sugar until light and fluffy. 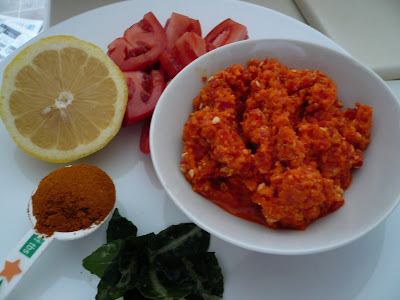 2) Add in eggs one at the time and continue to beat. 3) Add in lemon zest, sour cream and vanilla. Mix well. 4) Sift flour, baking powder and salt and add into the batter. Mix until combined. 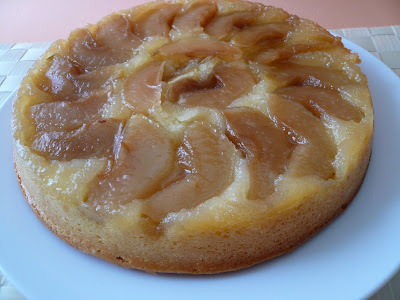 5) Pour the batter evenly over the apple and bake in 325 F oven for 30-40 min or until cake tester comes out clean. 6) Cool the cake for 15 min before invert the cake onto a flat plate. 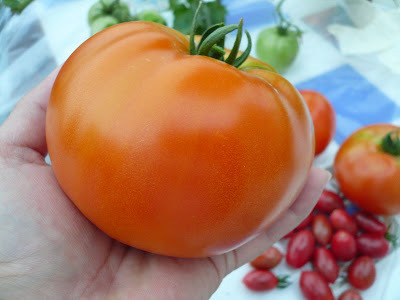 7) Serve warm or at room temperature. Corn is really cheap here now. For five to six ears of corn we paid only $1.00. I bought five the other day and boiled 2 and the rest I just removed the kennels and freeze it to be use for my fried rice. 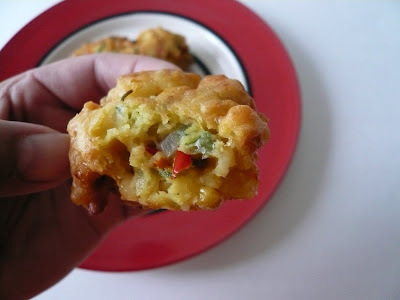 But this week I decided to make some corn fritters. Mixed all the above ingredients until smooth and free of lumps. The batter should be quite stiff. Heat up some oil in pan and drop a tablespoon of batter into the oil. Cook on both side of each fritter until golden brown. 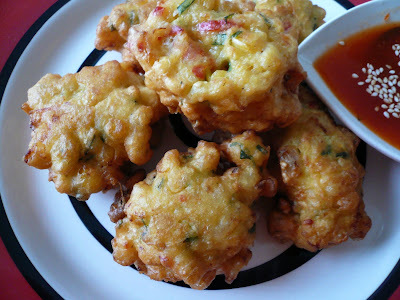 Drain the oil on paper towel and serve the fritters with chili sauce. There are times I really don't know what to cook for dinner. I will always end up making fried rice or fried noodles which are the easiest. 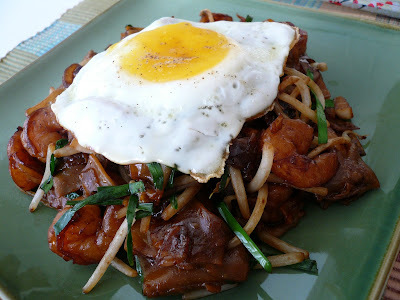 One of my favourite is Mee Goreng Mamak. 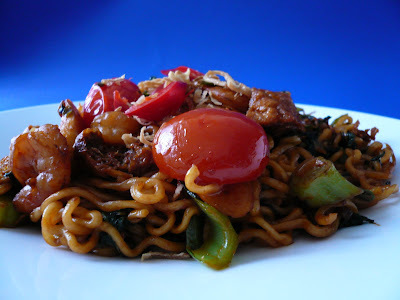 I just boil a packet of instant noodles and stir fry it with some meat or vegetables. Since I don't have the regular yellow noodles I just used the instant one. This recipe is for 2 serving. 1) Heat up oil and fry garlic and shallots. 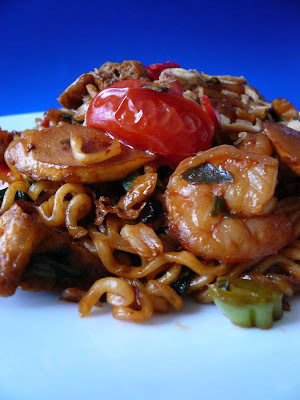 2) Add in fish cake, taufoo, shrimps, cut chili and stir fry for 1 min. 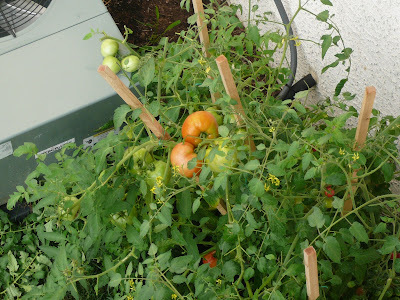 3) Then add in noodles, mustard green, tomatoes and seasoning. 4) Continue to fry until dry and lastly add in lemon juice. 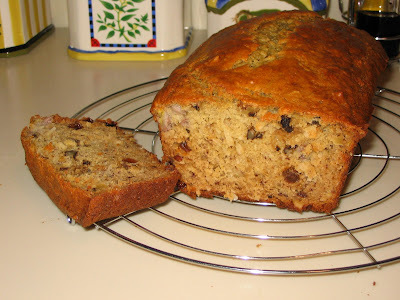 What do you do when you have some over-ripe bananas on your kitchen counter. For me I will make banana bread. I've been making this bread for so many years and I can't even remember where I got this recipe from. I made this bread a while ago and forgot to post it. 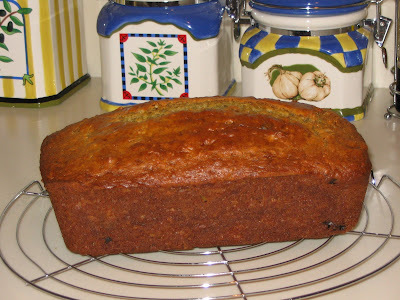 This is a no frills banana bread and is very moist and tasty. 1) Pre-heat oven to 325 degree F and lightly oil a loaf pan. 2) In a mixing bowl sieve flour, salt, baking powder and baking soda. 4) Fold the flour into the banana mixture and mix well. Add in the walnuts. 5) Pour into the loaf pan and bake for 45-50 min until the bread is done. 6) Allow to cool for at least 30 min before removing from pan. Note : You can also add in raisins or choc. chips to this bread. 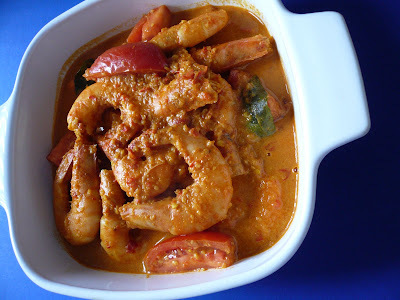 This is a mild curry dish but is rich with coconut milk and spices. 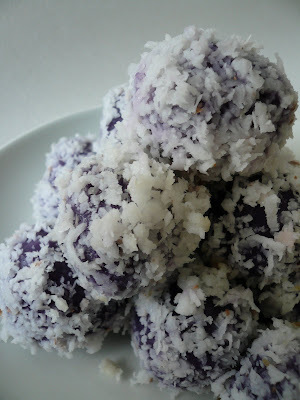 Is easy and fast to cook and goes really well with white rice. Blend the above ingredients with some water into a paste. 1) Put some oil into the frying pan and stir-fry the kapitan paste, curry powder and curry leaves for a few mintues or until fragrant. 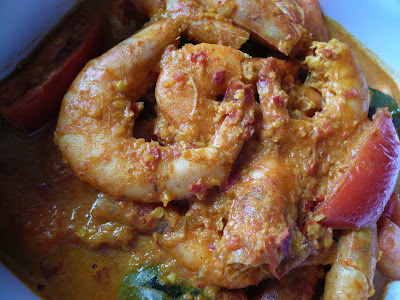 2) Add in prawns and stir fry for 1 min and then add in the coconut milk. 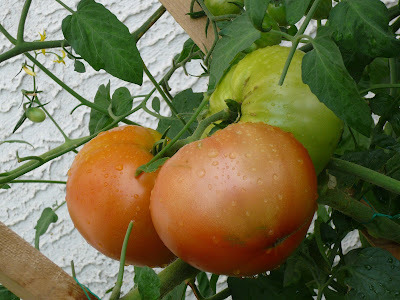 3) Cook for 2 mintues and then add in the tomatoes, lemon juice, sugar salt and pepper to taste. 4) Cook for another 3 mintues and dish out and served with warm rice. Note : You can used this paste to cook with chicken too but it will take longer to cook. You can add more coconut milk this dish if you want more gravy. This is what I served most of the time from our kitchen. My hubby will have his Western food and I will have my Asian food. Sometimes I wonder if any of you face the same problem as me :) I don't mind having Western food but I still need my Malaysian food from time to time. Hubby don't mind Chinese food either as long as is American Chinese food (from the Chinese buffet) because to him our Malaysian food are simply too strong smell and flavour . But I am lucky in many ways because he is not fussy eater. I can just prepared him a simple salad or a sandwich and for me will be a bowl of fried rice or noodles. 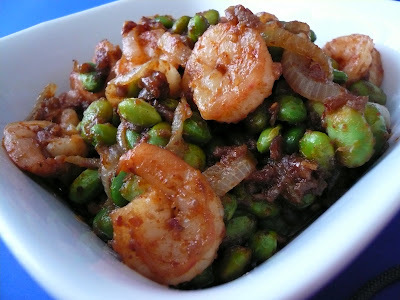 This is a really mild aromatic curry and really easy to prepare and cook. If you want it spicier you can add more chillies to it. 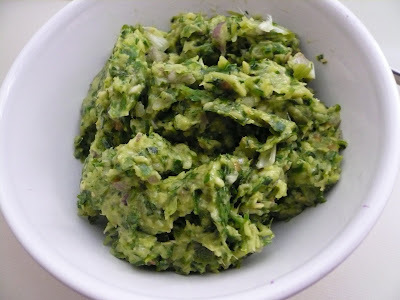 1) Blend all the paste ingredients with 3 tbsp of water. 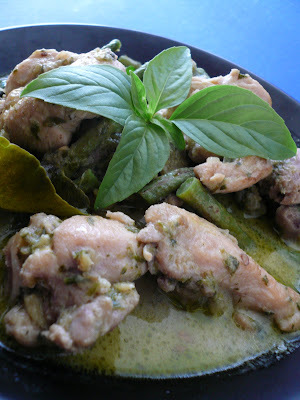 2) Heat up 2 tbsp of oil in the pan and stir in the green curry paste and stir fry for 2-3 min. Be careful not to burn them. 4) Add in the coconut milk, water, lime leaves and simmer for 10 min. 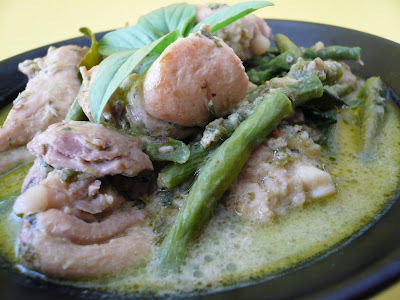 5) Add in long beans and lower the heat and continue to simmer until chicken is tender. 6) Put in seasoning to taste and Thai basil. 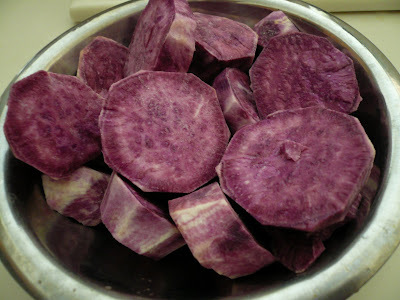 I was talking to Zue on Sunday about everything under the sun and as usual it will end up with food :) We talked about sweet potatoes and I told her that I bought some special sweet potatoes from Philly Chinatown. 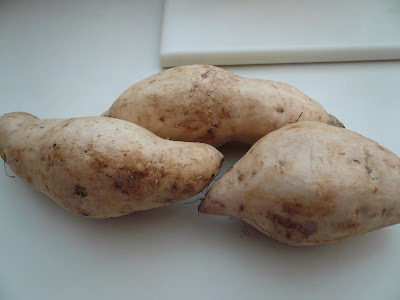 Since she too bought some sweet potatoes last week so we decided to make ondeh ondeh together in a different kitchen. 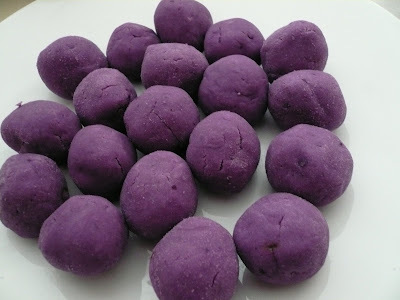 Here is my purple version of the ondeh ondeh. Note : Can someone enlighten me why the boiling water turn into green when I boil the potato balls? There must be some scientific reason for that. I learned to bake this bread when I took up Italian baking lesson at New York Culinary School with the famous pastry chef Nick Malgieri and I've been making this bread ever since. Is rustic and very easy bread to make and you can put any topping you want but the most common one will be rosemary and olives. 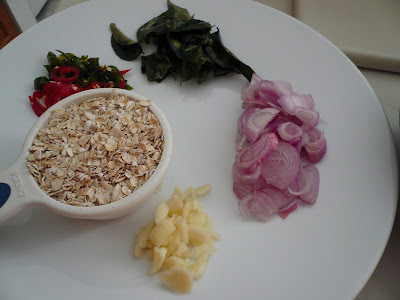 You can even put all kinds of herbs, anchovies and also onions. 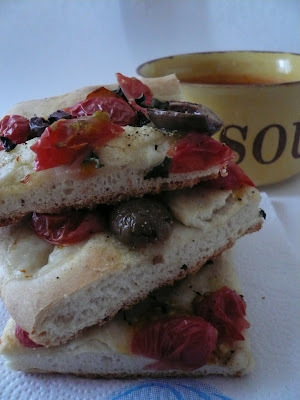 I always like my foccacia with fresh cherry tomato and olives. The other one is with sun dried tomato with olives. In a mixing bowl combine flour and salt. Add in the yeast mixture and turn on the mixer and knead dough. Slowly drizzle in the olive oil. Continue kneading until the dough is smooth. It might take about 5 min but if you knead by hand it will take longer. Transfer the dough to a lightly grease bowl and cover with a kitchen towel and let it raise in a warm place for an hour. It should double it size. Punch down the dough. Lightly oil a baking pan and put the dough into the centre of the pan. Lightly oil your fingers and push the dough evenly out on the pan. Put a bit of indentation on the surface of the dough to creates a nice little pockets for the topping and olive oil. Rest the dough again for 20-30 min. 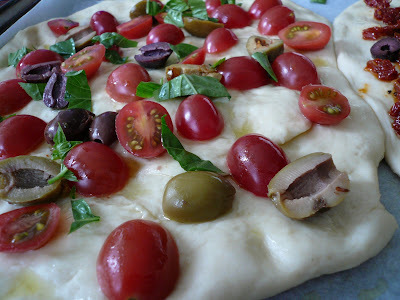 When the dough is risen, scatter the topping all over and drizzle with some olive oil. 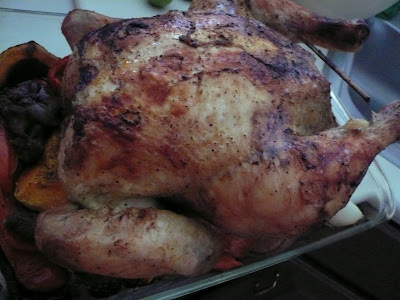 Bake in a pre-heated 350 degree F oven for 30 min or until it golden brown and cooked through. Slice and serve with soup or eaten on its own. 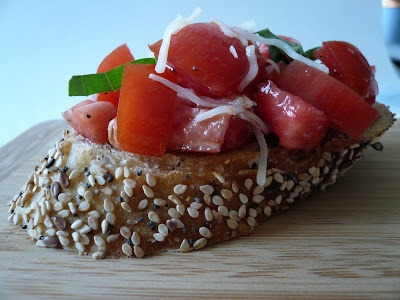 Note : I made a mistake by putting the basil on the bread and it was burn. So sprinkle the basil only after the bread is done. Carlos loves tangy dessert especially lemon cake and lemon bars. These luscious bars are easy to make. 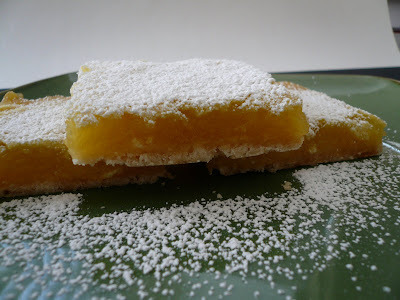 The crust is like a shortbread with tangy lemony custard and with a bit of powder sugar dusting. These bars are just delicious with a perfect balance of sweetness and tartness. 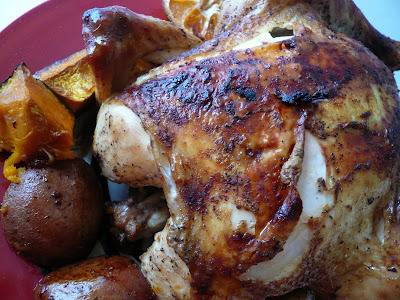 On the days when I am just too lazy to cook anything fancy I will just make a roast chicken. 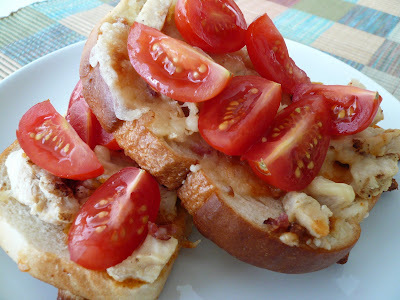 To me is comfort food and really simple to make and with the leftovers I can make chicken sandwich or chicken salad the next day. I like adding some vegetables like carrots, peppers, pumpkins, onions and potatoes to the roasting pans. Get a chicken between 3-4 pound and clean and trim off the fats. 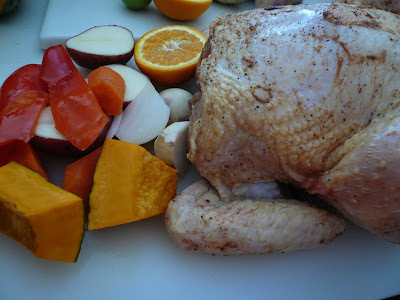 Dry the chicken and generously rub it all over with balsamic vinegar, salt & pepper, onion powder, garlic powder, paprika and stuff the cavity with cut onions, orange and thyme and secured the legs with bamboo skewer. Let it marinate a few hours in the fridge. Cut some carrots, red peppers, pumpkins, onions and potatoes in chunks. 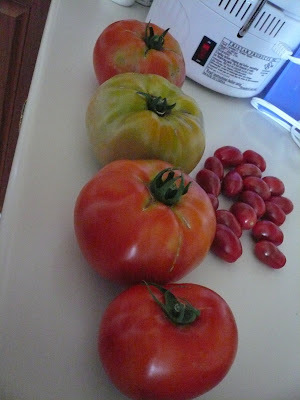 Place them in a big baking dish and drizzle with some olive oil, salt and pepper. Toss it well. Place the marinated chicken on top of the vegetables and drizzle and rub some olive oil on the chicken. Bake in 400 degree F oven for 1 hour 15 minutes or until the thermometer in the thigh reads 170 degree. Remove and let it rest for 15 min before carving it. Enjoy!!! I have been craving for some Asam Laksa since reading about it at Mybuddies for the past weeks and when I visited Zuraida last weekend at Harrisburg we found some daun kesom at the Vietnamese store there. 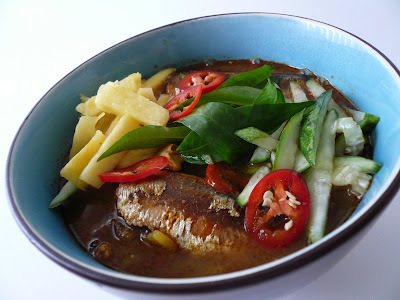 So with a packet of ChanHong Asam Laska paste from http://www.mytasteofasia.com/ and a can of sardin fish I get a yummy bowl of mouthwatering Asam Laksa. The only thing that was missing from the bowl of Asam Laksa is the shrimp paste. I have to remember to include that in my next order from http://www.mytasteofasia.com/. Cook the Asam Laksa according to the instruction on the packet. I used a packet of the Asam Laksa paste with 3 bowl of water. 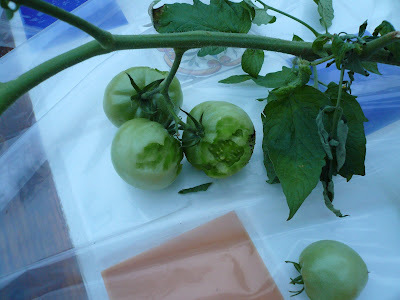 Add in a can of sardin (minus the tomato sauce) and for extra tangy and spiciness I add in some tomatillo (from Zue's garden) and a jalapeno pepper. 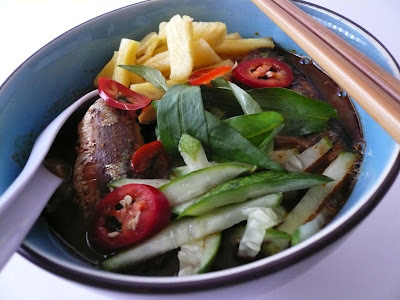 When is done serve it with noodles and garnish it with julienne cucumber, pineapple and daun kesom. There are days when I am just too lazy to cook. 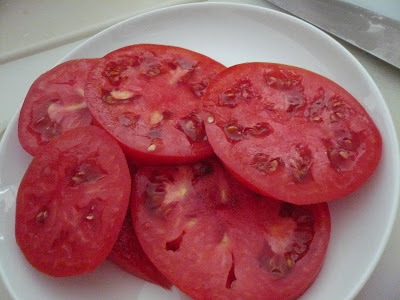 Since I have so many tomatoes from my little garden I decided to prepared something simple for dinner. Lucky Carlos is not a picky eater so he is fine with it. 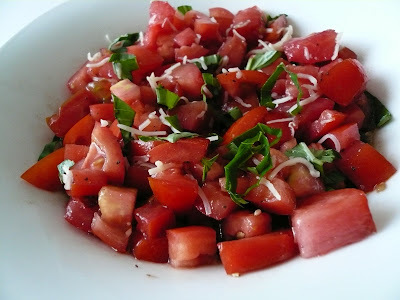 We just had tomatoes salad, bruschetta and cheese and crackers.